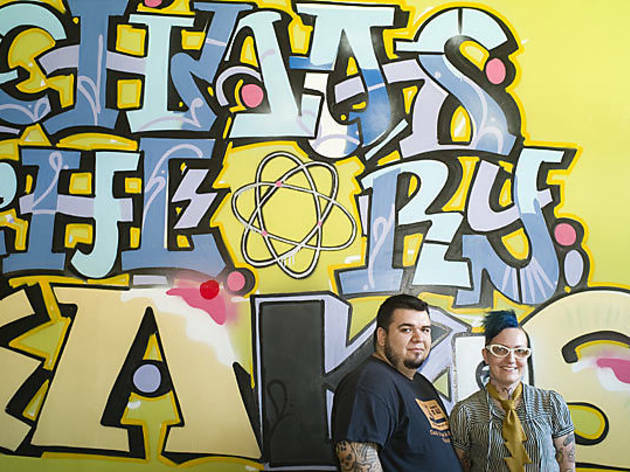 Like a phoenix rising from the ashes, Michelle and Vinny Garcia of Bleeding Heart Bakery fame are preparing their pastry comeback, and this time it’s personal. Lucha Dulce, which translates to “sweet struggle,” is a passion project for the Garcias, celebrating their love for Mexican culture and food, as well as the Pilsen neighborhood they now call home. The Garcias developed the idea for a Mexican bakery five years ago but put it on the back burner to continue building the Bleeding Heart brand. When they finally pulled the plug on BHB last year and moved to San Francisco (where Michelle worked at the Four Seasons baking desserts for VIP guests and Vinny created cakes from home), they realized the time was right to do something they were both passionate about: homing in on Vinny’s Mexican heritage. When they left Chicago, their intention was never to leave permanently. After clocking time in San Francisco, their living expenses grew to be too much, prompting a move back to Chicago to establish new roots in Pilsen, a neighborhood Michelle and Vinny lived in years ago and were excited to revisit. Lucha Dulce is a tighter focus and different direction than BHB, allowing the Garcias to concentrate on their strengths and separate themselves from their past, which is riddled with controversy and slander what the couple see as unfair attacks. “We wanted to go as far away from Bleeding Heart as possible, while pleasing the same people,” says Michelle. Gone is the miscellany of punk rock pastries. In its stead are what Michelle refers to as an “American girl’s take on Mexican pastry,” such as gelatin roses, candied sweet potatoes and Mexican candies inspired by the kind found by the register in Mexican grocery stores (the latter are a favorite of Vinny's). The only BHB staple she’ll carry over is her fan favorite “Take A Hike” scone. Other pastries include conchas, Mexican hot chocolate croissant stacks, tarts, Mexican-inspired macarons, and gingerbread pigs (“Anyone who loves Mexican bakeries like we do knows what we’re talking about!”). Vinny will continue to bake his famous cakes. Coffee will come from West Loop–based Sparrow Coffee Roastery, and the Garcias will continue to source as locally as possible, going organic when they can. 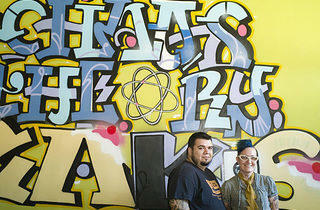 They’d like to introduce classes down the road and feature a chefs’ table for tastings. The space is smaller, the hours are shorter (so they can spend more time with their kids), and there are no expansion plans. The Garcias are working with Siren Betty on the design. Compared to the vibrant look of BHB, Luche Dulce will be dialed down with natural woods and pops of red and black. A small front space will feature a counter by the window and a few two-seat tables. The kitchens (one for Vinny's cake-making and one for Michelle) will be open or behind glass, so everyone can see the baking. As for the couple's segue from BHB’s broad repertoire of eclectic pastries to Lucha Dulce’s focused array of Mexican-inspired sweets, Michelle explains it simply: “We did my thing for a very long time, and now it’s time to do Vinny’s thing." Lucha Dulce (1659 W 21st Street) is slated to open late spring or early summer. Follow the progress on Twitter @luchadulce.